Thank you for visiting our donation page! Please donate here to support our vision for achieving a nuclear-weapon-free world! 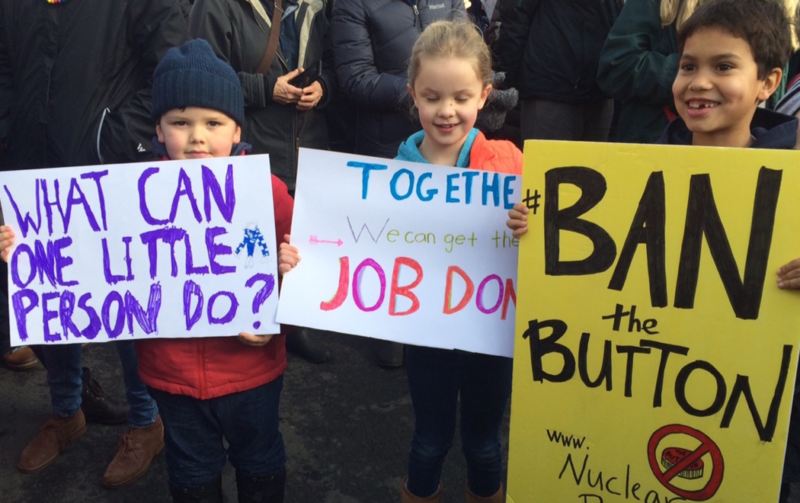 Your contribution will help us develop educational resources and provide popular education and strategic support to communities across the country ready to take action for nuclear weapons abolition. The Treaty Awareness Campaign is committed to using the 2017 Treaty on the Prohibition of Nuclear Weapons (Nuclear Ban Treaty) as a tool to educate and mobilize people across the US to take direct action is support of nuclear weapons abolition. We educate individuals, businesses, faith communities, schools, and organizations about the continued risks and costs of nuclear weapons. We help them to align with the Nuclear Ban Treaty, by disconnecting as far as possible, from the nuclear weapons industry. This sends a powerful message to the government, to corporations, and to the public: Nuclear weapons are inhumane, and they are now illegal under international law. We work to empower individuals at all levels to act against nuclear weapons and contribute to the global effort to eliminate nuclear weapons once and for all. Why isn’t anyone challenging the withdrawal?